Scotobiology is the study of the relation between darkness and biology. Light pollution has adverse effects on the general well-being of the different biological systems. Scotobiology can be defined as the study of the biology of darkness. It involves the study of the systems that require the nightly darkness for their efficient functioning. Without the nightly skies, the system's performance is prevented or inhibited from the effective performance. Scotobiology attempts to give reason to the effects of darkness on the functioning of the different biological species such as animals, plants, and microbes. The study of scotobiology has been going on for over a century. However, significant developments of the concept began at a conference about light pollution in Ontario, 2003. The conference aimed to study the deleterious effects of light pollution on our biological systems. Evolution of many biological systems in the universes occurs in an environment where there is the alternation of light and darkness, day and night. In the temperate regions, the lengths of days and nights vary according to the seasons. Organisms of the universes have evolved to use the range of day and night in the integration of the various physiological and social behaviors depending on the season. Many organisms measure precisely the length of the nights. Light pollution, therefore, hinders the ability of organisms to determine the length of the nights. Failure to establish the night length affects the manner in which the organisms integrate their physiological processes and their social behavior. Light pollution has adverse effects on the general well-being of the different biological systems. Specific scotobiological responses can be seen in various living organisms such as animals, plants, birds, and insects. For instance, many insects are attracted and tend to fly towards lights. Light pollution causes many insects to concentrate around lighted areas. 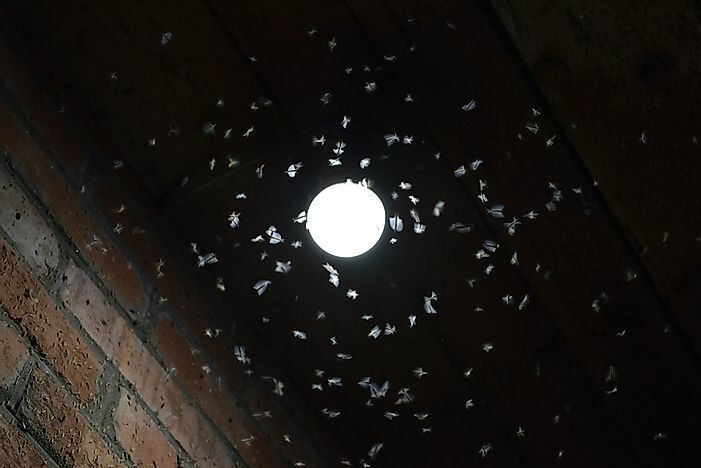 The concentration of insects in lighted regions predisposes them to prey animals and birds, therefore, contributing significantly to losses in the bird population. Some insects also require darkness for mating and breeding. Light pollution, thus, interferes with the reproduction patterns in such insects. Some insects also need darkness in their migration patterns. Migration of such insects is adversely affected by light as the light tends to disorient them interfering with their movement. Massive losses in the bird population have been significantly contributed to by collision of the bird with illuminated objects. This fact is because birds are attracted to light just like insects. Darkness is also crucial because it influences the migration pattern of birds. Light pollution, therefore, disorients birds making them an easy target for prey animals and birds. Darkness also affects the behavior of animals. Wolves for example mate, hunt, and feed during the night. The hunting, feeding and mating behaviors of many wild animals and amphibians are adversely affected effects of light pollution. Lastly, plants require darkness for their developmental processes such as dormancy, flowering and senescence onset. Plants also respond to the measures of the lengths of day and night in their developmental process. For, this reason we have long day plants that require more light to blossom and short day plants that need longer days to blossom.